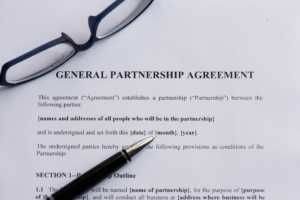 A General Partnership (GP) is an agreement between partners to establish and run a business together. It is one of the most common legal entitiesCorporationWhat is a corporation? A corporation is a legal entity created by individuals, stockholders, or shareholders, with the purpose of operating for profit. The creation involves a legal process called incorporation where legal documents containing the primary purpose of the business, name, and location that do business. All partners in a general partnership are responsible for the business and are subject to unlimited liability for business debtsDebt CapacityDebt capacity refers to the total amount of debt a business can incur and repay according to the terms of the debt agreement. A business takes on debt for several reasons, boosting production or marketing, expanding capacity, or acquiring new businesses. How do lenders assess how much capacity for debt a company has?. A general partner is a member or partner in a general or limited partnership with unlimited personal liability for the debts of the business. A general partner actively manages and exercises control over the company. For example, let’s say that Fred and Melissa decide to open a baking store. The store is named F&M Bakery. By opening a store together, Fred and Melissa are both general partners in the business, F&M Bakery. It is important to note that each general partner must be involved in the business. For example, Fred takes care of logistics and purchasing orders while Melissa oversees the store operations. The income generated by the business is split between Fred and Melissa. At the same time, Fred and Melissa are equally responsible for any losses incurred by the store. Creating a general partnership is simpler, cheaper, and requires less paperwork than forming a corporation. General partnerships do not pay income tax. All profits and losses are passed through to the individual partners. A partnership can be dissolved at any time. Due to the lack of corporate structureCorporate StructureCorporate structure refers to the organization of different departments or business units within a company. Depending on a company’s goals and the industry which it operates in, corporate structure can differ significantly between companies. Each of the departments usually performs a specialized function, a general partnership does not establish itself as a separate business entity from the partners. Partners are unprotected from any lawsuits against the business and their personal assets can be seized at any time to cover unmet debt obligations of the business. Each partner is liable for the actions of the others. If one partner executes an agreement without the knowledge of the other partners, the other partners are still obligated to honor the terms of that agreement. In a limited partnership, at least one partner possesses unlimited liability (the general partner) while the other partners are subject to limited liability (limited partners). Limited partners are not involved in the active management of the business and cannot lose more than the money that they have contributed to the partnership. In a limited liability partnership, there is no general partner. All partners are allowed to be involved in the management of the company and all partners enjoy limited liabilities. Limited liability partnerships are preferred by professional service businesses because the partners in an LLP are not liable for negligence claims made against other partners.